A young girl is transported from her inner-city neighborhood to Viejo San Juan in this bilingual picture book. Initiated in 1985, the MTA Arts & Design collection of public art now encompasses more than 250 projects, creating a dynamic underground museum of contemporary art that spans the entire city and its immediate environs. 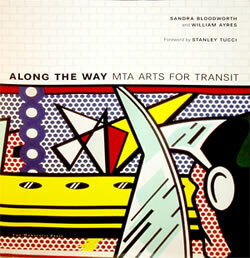 Since the program was founded, a diverse group of artist – including Elizabeth Murray, Faith Ringgold, Eric Fischel, Romare Bearden, Acconi Studio, and many others – has created works in mosaic, terra-cotta, bronze, and glass for the stations of the New York City Subways and Buses, Metro-North railroad, Long Island Rail Road, and Bridges and Tunnels. An update of the highly successful Along the Way, this expanded edition features nearly 100 new works installed in stations since 2006, including Sol Lewitt’s Whirls and Twirls (MTA) at Columbus Circle, Doug and Mike Starn’s See it split it, see it change at South Ferry, and James Carpenter’s Sky Reflector- Net at Fulton Center. 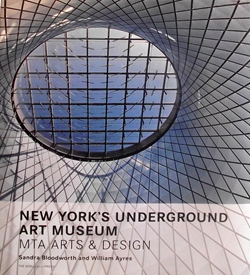 The book illustrates how the program has taken to heart its original mandate: that the subways be “designed, constructed, and maintained with a view to the beauth of the appearance, as well as the to their efficiency.” MTA Arts & Design is committed to preserving and restoring the original ornament of the system and to commissioning new works that exemplify the principles of vibrant public art, relating directly to the places where they are located and to the community around them. Maria Dominguez’ work appears in page 219. Along the Way is a tour through New York's underground museum of contemporary art, works commissioned by MTA Arts for Transit for the subway system and commuter rail lines. Vivid murals by Roy Lichtenstein and Romare Bearden convey the energy of Times Square while Robert Wilson's Coney Island Baby captures the festive spirit of the city's playland. Among the many projects currently in development are a multi-dimensional installation by Mike and Doug Starn at the South Ferry complex and a large-scale ceramic "wall drawing" by Sol Lewitt at Columbus Circle. Initiated in 1985, this collection of site-specific public art now encompasses more than 160 pieces in mosaic, terra-cotta, bronze, faceted glass and mixed media. Artist represented include Elizabeth Murray, Faith Ringgold, Eric Fischl, Nancy Spero, Michelle Oka Doner, Maya Lin, Mary Miss, Tom Otterness and the Acconci Studio. More than fifty projects are currently under way, making the Arts for Transit program one of the most significant public art initiatives in the world. Maria Domínguez' work appears on page 191. 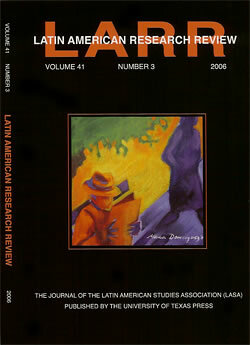 Selected “Man Sitting” from Domínguez’ MTA collection (Urban Series) For their November 2006 cover. Their journal is distributed to all the universities in the United States. 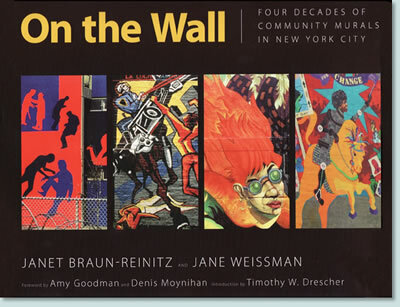 In 2009 authors Janet Braun-Reinitz & Jane Weissman published ON THE WALL: Four Decades of Community Murals in NYC published by University Press of Mississippi. This high quality documentation, gathers a full range of photos with different community mural styles as well as a muralography with the name, dates and sponsorships of the artists who made them during the past forty years. This unique and long awaited book is pertinent to New York’s community mural history and the communities that were impacted by them. It arrived at a time when most of the murals no longer exist. Among those selected here are those made under the leadership of Maria Dominguez; Nuestro Barrio (1998), Bronx Allegory” (2007) and along with Artmakers La Lucha Continua (1998).